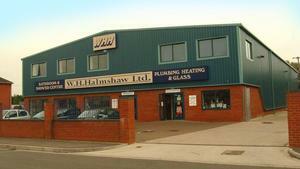 At W H Halmshaw Ltd we’ve been serving the people of East Yorkshire and North Lincolnshire for over 40 years. From humble beginnings, we’ve developed into the region’s leading independent suppliers of bathrooms, plumbing/heating supplies and glass products. Whilst things have changed a lot in the past 40 years, we’ve never lost sight of the principles the business was founded on and today, enjoy a strong reputation for friendly customer service, high-quality products, and excellent prices. We’re completely independent and aren’t tied to any specific brands or manufacturers. This means we can pick and choose from a huge range of the best products available at any one time, and provide expert, impartial advice to all our customers. In everything we do, we aim to be professional, dependable and trustworthy. We enjoy a huge amount of repeat business and referrals via word of mouth, thanks to our commitment to customer service. What this means in practice is that all our staff members are knowledgeable, helpful and experienced, and deliver the same personal service to every customer that walks through the door. We know that customers don’t want the hard sell – they want friendly advice and honest service. At all times, we aim to keep large quantities of stock on site, so when you need components, you can get hold of them quickly, and at great prices. Our showrooms and sales desks are conveniently located in both Beverley and Hull, and are open six days a week (Monday – Saturday). In addition, we also offer free delivery throughout the region. Why not come down and visit us today, and find out why more and more people are choosing to shop with us.